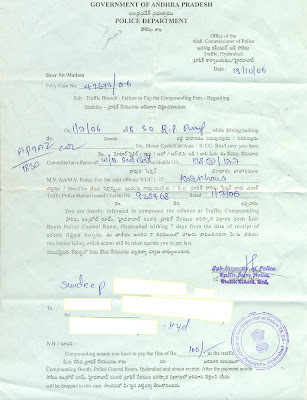 In the recent past I have got booked for traffic offenses 3 different times in 3 different ways. I am not sure if the police have got smarter and stricter or have I been breaking the law a bit too frequently of late. Anyway what I found interesting is the different ways that you can get booked now which is what I want to talk to you about in this post. This is the traditional method. I jumped a traffic light and landed straight into the waiting sub inspector on the other side of the traffic signal.My bike key got confiscated till I paid up my Rs. 100 and I drove away. Well this is the time tested way where you get caught red handed and you have nothing to say to bail yourself out. 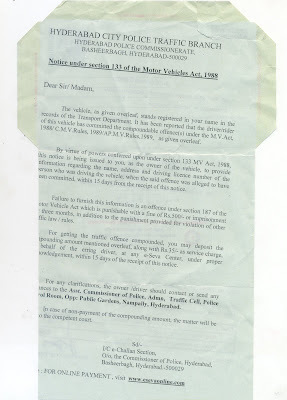 I was surprised a couple of days ago when I opened my mail box at home and I find this inland letter from the traffic police claiming that I was in a no parking zone on April 6th and that I can go online to http://www.esevaonline.com and can pay up my fine. So I go there and key in the details and voila all my details come up successfully. What worries me about this form of ticketing people is that there is no proof that I was in that area on that day and I was parked illegally. So I wonder how valid is this in a court of law. Being a website that I normally use to pay my electricity and telephone bills I promptly paid up as I did not want any trouble. 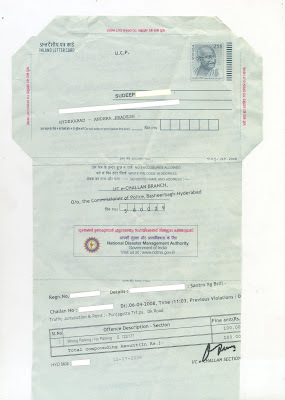 Last year a person in plain clothes visited my home and presented me a letter stating that I had a traffic violation and that he came to collect the fine. First of all the letter was hand written and the registration of the car that supposedly commited the offense was not mine and also the address was not complete. All it had was my name that was correct. So not trusting the person at my door step I told them that I would go to the traffic control room and pay the fine and the person went away. When I went downstairs and enquired with the watch man he told me that they wrote the letter out in the building. I checked online and I could not find any information about this challan number online. I immediately smelt a rat here and I was sure that this was some big scam in the making. I got caught once when I drove from wrong direction in a one-way! The waiting traffic constable gladly welcomed me there and I had to shell out a 100!